(See Above) We had a very persistent – albeit lower momentum uptrend throughout today’s entire session. It ended up being a high traction day for the trade alerts, 4 with-trend signals that caught progressively more upward movement each time, and a final counter momentum trade that took a while to get moving but eventually caught a nice down swing in the market. All 5 trades got you to a 1 point delta target – no lose configuration. Today was a great example of steady “Accumulation Day” throughout the entire session. (i.e. Drain is plugged, faucet is running, tub gradually fills up) Even though the market continued to float higher into the close, the system stopped issuing trade alerts after that last short, because the momentum was so low and the volume slowed. The main goal of Mondays in my opinion is to dip your toes back in the water after the weekend, and capture a few points of risk capital to get the week started off in the right direction. We easily achieved that goal today. (See Above) We had another knock-down, bang-up session in the markets today. As I mentioned early on in the System Notes Section, the ES has been hovering just a above a critical support level at 2030. (You can also see this on the general market if you take a look at the SPY daily chart and plot a horizontal line at 203.) This is going to be a big potential breakdown area for the markets and as we get closer to that area we may see major fireworks get set off as either the bulls attempt to protect that line in the sand or the bears try to drop the market hard there. So the closer we get to that level, the uglier the volatility is likely to become…. 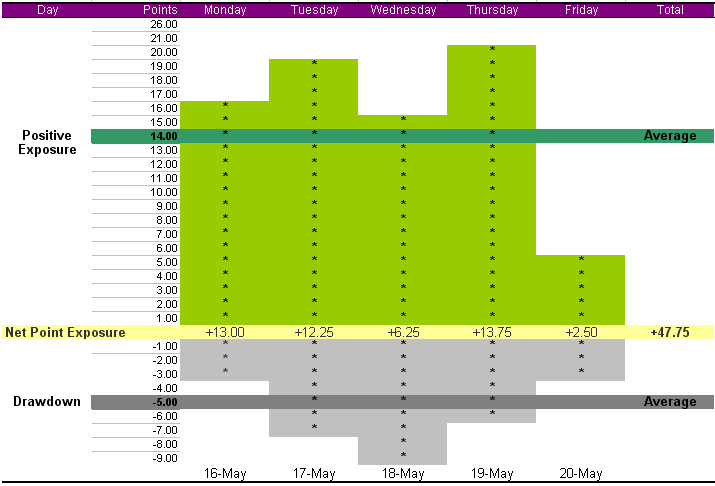 As you can see in today’s graph above, we got hit again with lots of early morning chop and quick reversals. The market was extremely jumpy today and we had wide – news induced swings. The 1st trade of the day (which was a Counter-Trend Short), was a quick stop-out if you took it, while the 2nd trade easily made most of that up. The 3rd and 4th trades were stop outs to varying degrees depending on how you played them, but the following 2 trades made some or most of that drawdown back. The following trade stopped or didn’t depending on how you played it.. but the final trade was the one we were gunning for the entire session. It was 11:50 CME Time… All quiet on the western front… 11:53 Alert LONG – Trade Barrier 2050.00 (4 Point Target) — 11:58 our 1 point Delta Target Hit – Plane off the runway.. landing gear up.. full monte target 54.25 – If the buyers can get us above 52.50 we should sail to target zone up at 54. Take a look at your 5-Minute ES Chart.. and you will see a textbook example of the type of multi-point breakout alert that the momentum system is designed to deliver. In review, it was tough going early on starting off with a loss but making it up only to give it back, etc. Today took a lot of stamina to get to the prize, and if you were able to stay in the game, you either ended up with a few net points or around Break-even for the day. Thursday, 5-19 (See Above) Today got off to a much smoother start with 3 back-to-back winners that got you a guaranteed 1-Point Delta fill to get you at a no-lose configuration and then went on to be nice multi-point winners. The next two trades, although they didn’t follow through very far give you a chance to take a 3 tick delta or tighten the stop down to prevent a full loss. The Counter Trend Short at 11:14 CME time up at 2030.75 would not have filled at that price, (I caught a fill 2 ticks lower) – the alert price got tagged exactly and then reversed for a sweet 5 point drop in our favor. Incredible precision on that one. The system had two spot on Counter Momentum Trades today right on the market. (The first one was the short up at 30.75 which also had a nice follow-through for us.) Today was a day where we quickly dropped down out of the morning quicksand zone which ran from 2034.00 to 2040.00 and we then spent the early part of the session shorting as the sellers sold the market off hard. Later the market hit bottom and 2022 and when all was said and done, we ended up with a classic V-Reversal day after a serious test and rejection of the critical 2030 zone. The market ended up all the way back in its morning quicksand zone. Today it was almost like shooting fish in a barrel for the first 5-6 trades, but you can see the final two trades were stinkers which underscores the importance quitting while you are ahead. If you can start off the day and rack up some nice point gains you should lock that in the bank and walk away from the computer or at the very least reduce position sizes way down and quit at the first signs of trouble so you can finish off with the bulk of your gains. (See Above) Friday’s are notorious for “giving it all back” so we only trade the first 2 hours and focus on light scalp trades. (Unless there is a rip-roaring trend in progress that simply can’t be ignored, its better to close up shop early and not put yourself at any more risk for the week) You can see that we had some light trades that produced a few points.